Would you like to earn an extra .25% on a currency that has lost over 90% of its value over time or would you like to invest in a commodity that has held its value for thousands of years? USDs and delusion pills handed out on the left; gold, silver, and sanity on the right. Proceed as you will. 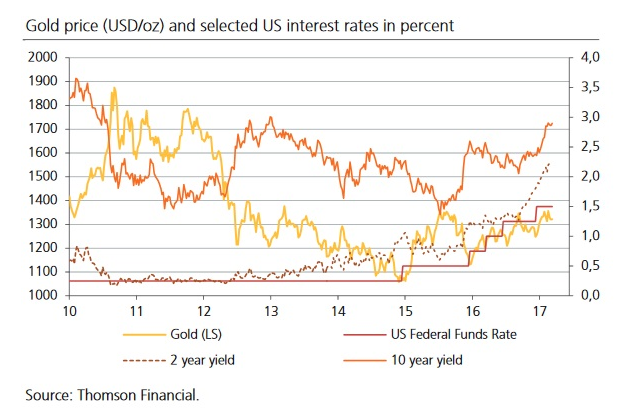 Rising interest rates represent a growing risk to the economic and financial structure: The latest cyclical upswing has been orchestrated by central banks’ ultra-low interest rate policy. The Fed’s tightening policy is like taking away the “punch bowl”, and if it raises interest rates too much, the party would definitely come to an end. It is against this backdrop that gold, even in times of slightly higher real interest rates, is increasingly attracting investors, which has ultimately led to a price increase. In a long-term perspective, one would expect a positive relation between the price of gold and the quantity of money. An increase in the money supply inevitably leads to a rise in prices of goods. This, in turn, reduces the purchasing power of fiat currencies. If and when gold is in demand for monetary purposes, one would expect that the price of gold (in terms of fiat currencies) rises as the quantity of money increases. At the current price, there is good reason to expect that gold can serve as insurance against the vagaries of the fiat money system, providing its owner with optionality: the upside price potential of gold in times of crisis – and in a fiat money system a crisis will return at some point, unfortunately.